You know what? The common complaints we get from the bench grinder users are, their grinder suddenly stops in the middle of the operation; the wheels unable to bring proper sharpness of the knives & blades, though some well-functioned grinders unable to deliver equivalent service for a long time. The sufferings of grinder users are not just limited to these, but all the users are facing problems for same two reasons; either they failed to choose the best bench grinder or failed to pick the right one for their needs. We are not, even will not, blame those people for their failing, probably they didn’t get any suggestion regarding buying bench grinder for their particular use. We don’t want you to fail to purchase the right grinder. That’s why we made a comprehensive content covering the top 10 bench grinder and ultimate bench grinder buying guide. After going through our reviews and guide, we hope you will definitely be able to be a satisfied buyer of the most perfect bench grinder for your use. So, stay with these words until you get yours! 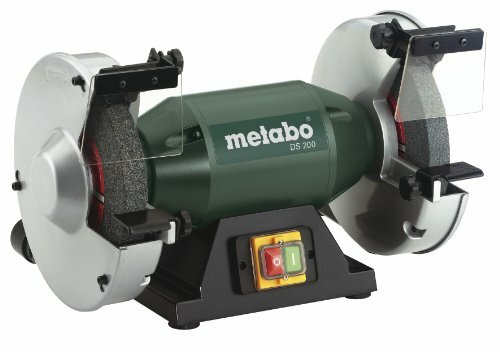 The DS 200 from Metabo is an astonishing powerful machine that can be the right pick for your industrial use. It makes smoothing, cleaning, and sharping of tough objects easier for the worker. This sturdy bench grinder is manufactured with high-quality industry-friendly materials and mechanism. As a result, it produces less vibration and noise during the grinding process and delivers continuous good service year after year. 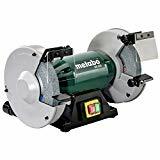 The induction motor is the key part of a bench grinder, this Metabo DS200 has mighty maintenance free induction motor. The motor is able to spin the wheels at a nominal rate of 3,570 RPM, which is an impressive speed for industrial operations. The industrial operation involves lots of firm materials’ smoothing and sharping, because of that the grinder has to tolerate plenty of high pressure, and this grinder does this job most efficiently. The grinder featured with variable speed facility, so besides industrial laborious use you can use this effectually for your regular household usage, you just have to keep the wheels’ speed friendly with your apparatus. Here wheels are protected with aluminum cover bayonet lock, that guarantees tension free grinding as well as hassle-free wheel changing opportunity. Grinding makes a lot of sparks but the DS200 has a perfect sparks defense system, its wheels are covered with aluminum shield and has two guards on two wheels, so throughout your sharping period, you will be clearly protected from sparks. The parts of the grinder come in an organized way and the parts are also very adjustable, so it requires minimal time to set up and start grinding. Dust protected emergency stop switch. DEWALT DW756 comes in Dewalt's trademark yellow and black combination coloring which I personally like. To me, as grinders are mostly used in hard, noisy, and dusty workshops it should look vibrant. DW756 designs for easy and effective use. Hardworking motor, less vibration during grinding, ample distance between the wheels are the key features of this bench grinder. When you combine the features and benefits of DW756 and compare it with its competitors, it will definitely be the best bench grinder for your money. DW756 has a powerful 5/8 Horsepower induction motor that offers excellent performance at a high RPM of 3,450. With such dominant motor and solid building, you can tackle the tough materials more conveniently and will experience yearlong constant great grinding service. Dewalt DW756 features two important integrated safety features in form of spark deflectors and eye shields on both wheels, to keep your body and eyes safe and sound from the broken piece of materials or stray sparks. To get the ultimate support and stability from your grinder, you should always mount your grinder on a solid surface. For a solid mounting, this unit features a handy rubber base mount that also prevents excess vibration during operation. Dewalt users find this feature very helpful, especially during tougher jobs. When a grinder has ample space between the wheels you will get perfect finishing cuts of the tools, this DW756 will provide you that advantage of a perfect cut. Here two wheels are separated by 12-1/2 inches, that is impressive. So, grinding even larger projects with DW756 will be free of interference and hesitation. Manufactured with incredibly sturdy and durable cast-iron base. 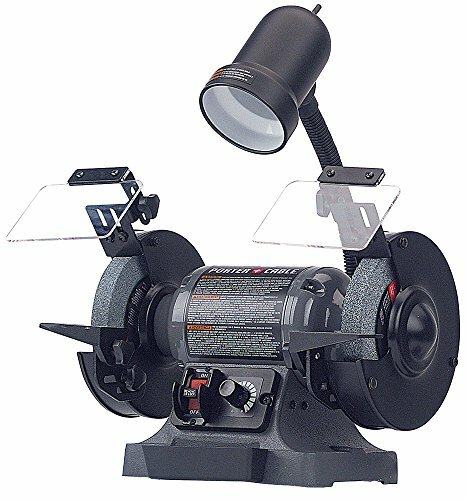 This solid base is perfect for using this bench grinder in a rough and tough workspace. Because of this robust structure, you will get aunchanging service for a long period. Sometimes slow is sweet. 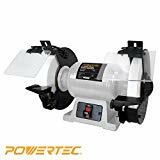 There are some tools that we have to sharpen but they cannot tolerate overheat, to take care of those sensitive tools Powertec introduced this BGSS801 slow speed bench grinder, which is also the best slow speed bench grinder in the industry. The BGSS801 is designed with a slow speed motor that means it doesn’t hurt tools too much and you don’t have to be worried about high levels of heat during sharpening and grinding projects. Other than slow functioning motor it also has safety features, other functional features those ultimately take care of both users and tools. The grinder has a unique ½ horsepower motor which yields a speed of 1725 RPM. As the motor is slow it doesn’t mean that the motor is under powered or unable to produce adequate power, rather this slow speed is healthy and perfect for smaller stuff those require more precision. 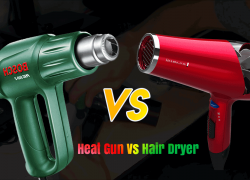 Slowness nature of the motor and the white aluminum oxide wheels deliver a minimal amount of heat or only the amount of heat that a flexible tool can tolerate. As the grinder is free of heating issue, you can sharpen your materials without having to wait for them to cool down in the midway of grinding. The outer body of BGSS801 is made from a resilient, heavy-gauge steel material. Combination of these materials put a positive effect on the overall lifespan of this Powertec creation. Here the heavy gauge steel base also reduces vibration and improves steadiness during operation. Locking power switch is another unique feature of this 8-inch bench grinder. It prevents accidental start of the device by children or a random person. Beside this, it also has other regular safety aspects like eye shields, spark deflectors etc. JET 577102 bench grinder is a combination of power and space saving facility. A shop that is short on space still has to do heavy industrial grade work, this one can be a solution for it. This robust machine grinds, sharpens and smooths with equal precision and gives a flawless result. Taking about its parts and features, it has a motor with plenty of power, two hard working wheels, pre-lubricated and enclosed ball bearings, and other essential features. The gadget is the right to pick for cleaning, buffing, sharpening, removing rust, and removing burs from metal. 1 Horsepower and single phase 115 Volt monster motor is the key part of JET 577102. This motor can handle tough industrial supplies those other bench grinders can’t even dream about touching. Owning this unit means you are unstoppable when anyone talks about grinding. An industrial bench grinder should be able to survive in rough and tough surroundings and this one lies up to the expectations. All durability credits go to the pre-lubricated and enclosed ball bearings and solid outer labeling. Because of the powerful motor and hefty size, most of would be user think this may vibrate during grinding, but it doesn’t. The installed rubber foot of this industrial bench grinder helps to keep it in place. Moreover, if you feel you need protection against vibration it is possible to shovel in the machine onto your work stand to keep it just stable. On top of the eye shields and spark deflectors, there is a lockable power switch. It’s a protection feature that keeps the device being inadvertently powered on. This is an additional layer of protection and I think it’s necessary for a busy workshop. 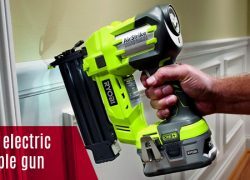 True Power 199 is a compact and portable bench grinder but capable of doing almost everything that a full-size grinder can do. It saves both money and time of the users, it costs less than a usual machine and takes less time to set up and operate. Along with this budget bench grinder, you also get variable speed option and an amazingly handy flexible shaft attachment for getting into hard-to-reach places. It works best for smaller applications, like sharpening knives or other minor tools. The grinder includes variable speed options with the powerful motor, that means you can adjust the speed of spinning keeping the toughness of the materials in mind. Spinning speed of the motor varies ranging from 0 to 10,000 RPM. 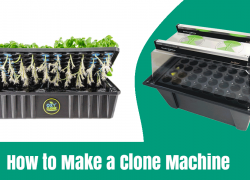 People who are fond of DIY projects this machine can be a good addition to their collection. 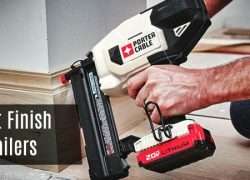 Normally, DIY projects deal with small and smooth materials’ cutting, polishing, resizing, cleaning etc., and this Truepower is well known for operating these resources. This space-saving grinder measures only 11 inches wide, 7 inches tall, and 7 pound in weight, which is really a compact device. Moreover, because of its small and compatibility characteristics it also becomes more portable, means you can move it around your workshop or transport it to different job sites effortlessly. Though the grinder is compact and extra portable it doesn’t sacrifice its safety issues at all. Safety features are managed well inside and outside of the device, such as eye shield for protection against sparks, tool rest for proper tool placement. Wen 4276 is another popular name of bench grinder. 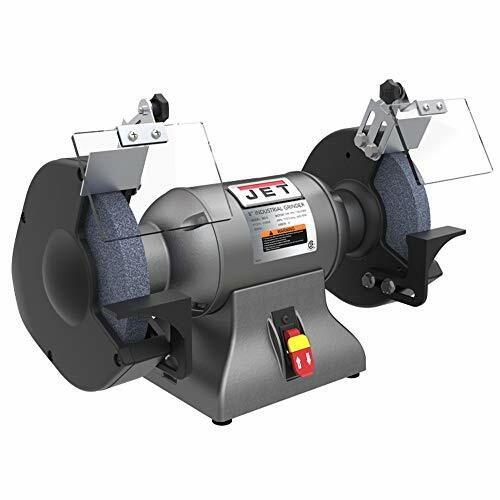 With the weight of only 16 pounds, the WEN 4276 is one of the smallest bench grinders in the market that has total body dimensions of 14 x 10 x 15 inches. This machine is compact yet powerful, it’s best for simple resuscitation of dull blades, screwdrivers, and scissors. Additionally, it provides reliability even in operating most difficult tasks. Overall this one is a well-balanced machine that will successfully suit your requirements. The quiet yet powerful 2.1 motor of this Wen production provides quick startup and steady speed of 3450 rotations per minute, which is suitable for prompt performances in various tasks such as shaping honing, even polishing. It’s a value-added component that is provided by only a few manufacturers, Wen 4276 has an awesome flexible work light attached directly to its secured body. 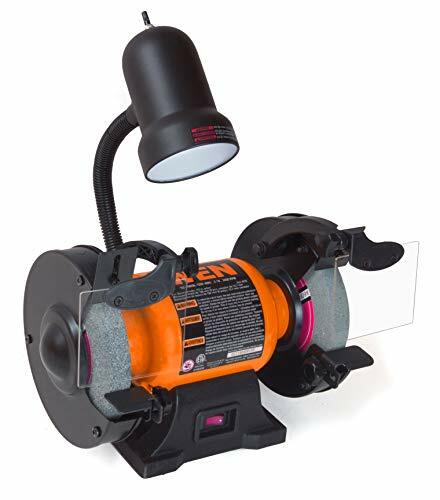 Work light allows you working precisely even in low light condition both in your home and workshop. 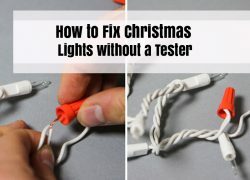 The light is adjustable, and you can change its direction as your necessity. 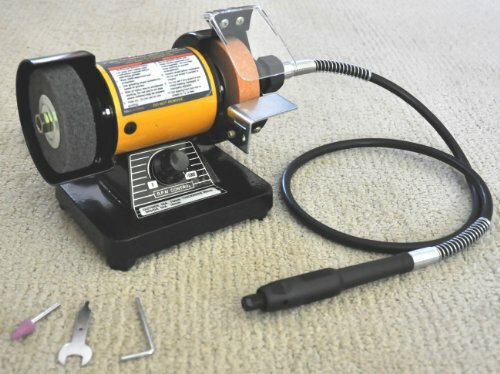 This budget bench grinder is easy to carry and move, weighs only 16 pounds. Though it is lightweight it does not compromise its durability, manufactured with substantial cast iron base. The solid base minimizes the wobbling that may occur because of wheels’ fast-spinning, it also facilitates safe mounting. To provide you with grinding accuracy and right placement of the tools, Wen 4276 comes with two adjustable tool rest just in front of each wheel. You can move and change the angle of the rest depending size and shape of your tools. b. Features 2 preinstalled 6-by-3/4 inch wheels, 60-grit, and 36 grit. d. Simple wheel guard removal for easy wheel changes. If you are looking for a special bench grinder for sharpening, then SKIL 3380-01 can be your solution. This grinder is specially designed for sharping lawn mower blades, kitchen knives, and for other lightweight duties that require a simple grinding. With its integrated LED lights just above the wheel, you will get more visibility even in the dim workstations. Here, the cast Irion base body will stabilize the unit so that you get your desire grinding experience, not shaking. 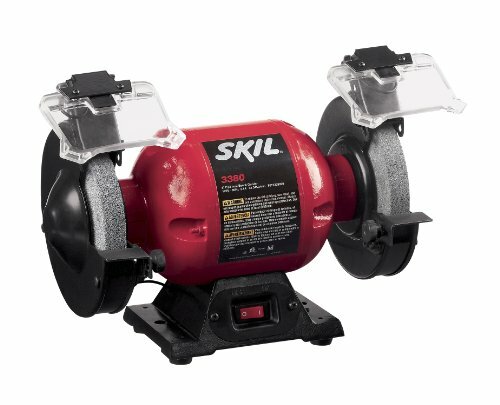 The motor of SKIL 3380-01 is powered with 2.0 amplifier that is able to spin the wheels at the rate of 3450 RPM, this speed is good enough for sharing. If you are looking for a sharping bench grinder, I hope you will be pleased with the speed. The bench grinder includes two types of 6-inch wheels, one is coarse and another is the medium wheel. The coarse wheel is used for easy and quick results, and the medium wheel is used for all other usages. As means of utility features, the grinder holds two spark protective eye shields and two adjustable tool rest, one each just before the wheel. Eyeshield protects from the scary sparks and tool rest works for accurate placement of substances. Moreover, it also has an awesome LED light for more bright grinding. The inner side of the grinder is filled with necessary stuff, the outside of the body also occupied with a rock solid structures, together with both eventually help the machine to deliver top-notch service with maximum accuracy. The cast iron base is the source of solidness of this machine. 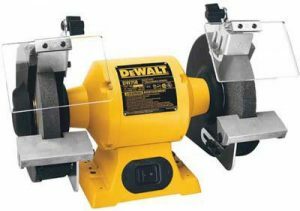 DW758 is a bench grinders for woodworking manufactured by none other than the Dewalt. A DIYer also will fall in love with this fantastic performer. The grinder is little larger, comes in 8-inch size with the body dimension of 17.8 x 12.6 x 10.8 inch. A combination of iron base and aluminum tool rests give the grinder a rock-solid outlook. Together with basic functional specification it also has an extra layer of protection, in combined you will get great performance in a safer way. The unit comes with a powerful 4.2-amp horsepower induction motor, it enables the wheels to run at speed of 3600 RPM, such powerful motor could be used to get done most of grinding work superbly. Additionally, the motor has an overload protection feature, which is indeed a helpful feature that keeps the motor away from overheating, thus help in prolonging the life of the grinder’s table. The grinder will operate more smoothly than an ordinary machine because of the exhaust ports at the rear of the wheel guard. Adjustable tool rest also help the machine to deliver smoother and exact performance. Like other grinders of our list, this also has eye protectors to keep the operator safe from sparks or miniature broken pieces of materials. Additionally, to make this grinder safer Dewalt added motor protection features. In general, Dewalt products are durable this DW758 is not an anomaly. It is manufactured with industrial cast iron base and motor housing for more sturdiness and extended lifespan. When a grinder has ample space between the wheels a user gets some advantages like moving, positioning larger and longer tools. 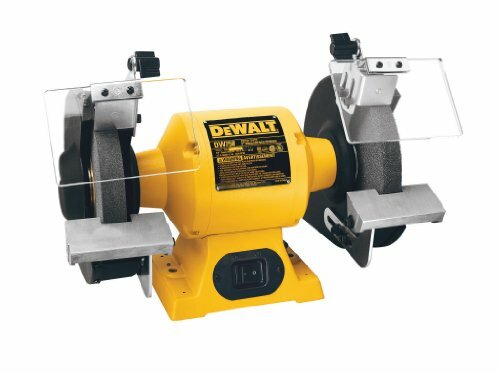 This Dewalt grinder has 12-1/2-inch distance between the wheels that means your grinding with this one will be more convenient. et 578008 is built to withstand the high volume demands of the busiest workshops. This high-quality machine does grinding, sharpening and smoothing with equal precision and delivers flawless results every time. 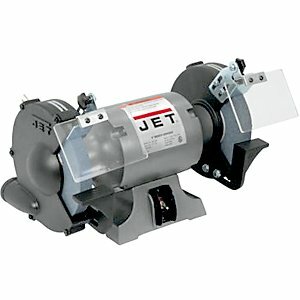 Jet planned this grinder keeping resilience in mind, as a result with the help of its beast motor and super-sturdy design, this bench grinder able to deliver a constant great performance for both small and extensive projects around the years. To stand out from the crowd, Jet also added a lockable power switch, making this a worthy item to install in busy worksites. The most talked feature of this bench grinder is its 1 HP motor. Because of its motor strength, it becomes one of best industrial bench grinders. It can handle rough and tough grinding jobs that other bench grinders hardly think about touching. Industrial grinders must be durable and have the capacity to function in rough and busy workshops month after month, and this grinder is not an aberration of users’ expectations. This durability credits mainly goes all the way to sealed bearings. Lockable switch prevents accidental starting of the machine, for a busy place like a busy workshop, it prevents lots of unwanted situations. On top of the built-in spark deflectors and eye shields, this machine features a lockable switch. Since you will be doing heavy scale grinding in the workshop the machine must mount steadily and tightly on the stand, Jet knows this very well that’s why provides reliable mounting facilities with the grinder. 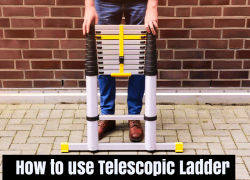 This machine can be mounted on the stand using heavy-duty mounting plates. Adjustable tool rest ensures correct positioning of the tools so that users can sharp, clean their materials without any hassle. Here rests are not attached firmly you can move depending on your tools size and structure. The PCB525BG by Porter Cable made its place in our list because of its all-rounder facilities. The machine is reliable, durable, safe, and has variable speed options for greater versatility. This one has got a simple black colored design with a work light on its head for perfect grinding even in imperfect low light condition. The machine also gives you the wheel versatility which is not common on products in this price range. Another worthy mention factor of this Porter Cable creation is its powerful motor, that makes every difficult grinding task effortless. One will fall in with this machine for the stout motor that it has got. Having speed controlling facility this grinder can be said a one in all bench grinder, here you can adjust motor speed keeping your supplies toughness in mind. Variable speed allows you doing you household grinding as well as your industrial grinding just buying a single bench grinder. Lockable power switch adds more security to a grinder machine. It keeps the machine protected from a random guy. The switch also minimizes the possibility of unwanted issues in a crowded workstation. Accidentally the machine can be started by children even by your pets, lock-ability also keeps them safe. Sometimes you have to buy an additional light for grinding in a low light situation, if you have this one you don’t go for any extra light, the machine has a handy light attached with it. The light is moveable, so you will get perfect focus on your job. You will not get your job correctly done if the machine is unstable. With the help of thecast iron base, this product will provide supreme stability during the action. Whatever speed you need, you will get outmost support from this device. The bench grinder also gets wheels’ dresser, using this you can take care of the wheels after every grinding. Basically, if your wheels are cleaned you grinding will be finished within a short time than usual. a. 2.5-amp ball bearing induction motor. d. 36 Grit coarse 3/4" wide wheel, (1) 60 Grit Medium 3/4" wide wheel. Buying a bench grinder is the first condition of having good grinding experience. If you are experienced then you can skip this grinder buying guide, but if you are a novice and planning to buy your first bench grinder then this section will help you a lot. 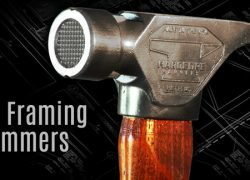 Hopefully, by the end of this guide, you can act like a pro during purchasing of your first bench grinder. 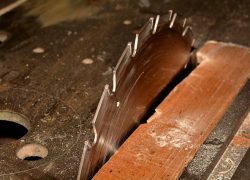 Here we dived the factors to consider during buying into two sections, essential factors that must have the a bench grinder and additional factors that good to have but not compulsory. A motor is the key part of a bench grinder, it helps to spin the wheels to gain speed to do the sharping, cleaning, and removing jobs impeccably. Depending on the purpose of use, motors come with different Horsepower and different Amplifier. Normally, an industrial motor that is made to handle rough and tough industry grade objects have high Horsepower motor with high RPM (revolutions per minute), and general use motors have comparatively low Horsepower motor with low RPM. The motor spins the wheels, and wheels do the job. There are both one-wheel grinder and two-wheels grinder in the market. Wheels are also made with different material and shape for doing different kind of operation. Aluminum oxide and silicon carbide abrasive are two common types of ingredients those are used to manufacture the wheels, aluminum oxide wheels are perfect for grinding steel and silicon carbide abrasive wheels are best for cast iron. Wheels also have different types, among them:the straight wheel, cylinder wheel, and tapered wheel are common, and saucer wheels, diamond wheels, and cut off wheels are hardly noticed in a bench grinder. Durability is a must-have quality of a grinder; proper durable grinder ensures even service year after year irrespective of workshop ambiance. Industrial bench grinders’ makers are more durability conscious as their grinder have to go through rigorous working sessions. In general Irion case built bodies are robust. Mounting is another crucial characteristic that a grinder should possess. Tight mounting on a hard surface makes less vibration and helps the operator to finish his/her grinding effortlessly. Above mentioned features were essential functional qualities for the bench grinder, here are some safety features that will ensure safe using of the machine. Any type of grinding job generates sparks and broken materials. To keep users’ eyes protected from the sparks and broken hard pieces, manufacturers attach two separate shields just on the wheels. If your grinder doesn’t have any installed protectors with it, you have to use googles or helmet during grinding. Tool rests are used for the perfect positioning of the tools. 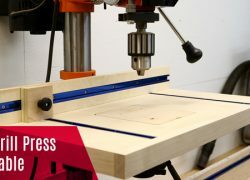 It works as a support for the tools and helps the user to get right grinding shape and sharpness of the tool. Both wheels have separate and adjustable tool rest, you can adjust the rest position depending on your tools shape and size. The following features are not matter of concern for normal bench grinderusers. Butwith thesefeatures, you can do your grinding comfortably. Wheel distance means the distance between the right wheel and left wheel. It is a matter for those who will be grinding larger size objects. 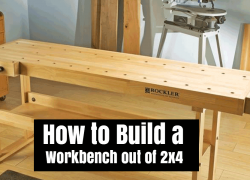 Having ample space between wheels give you extra advantage moving and angling your tools. Bench grinders are widely available in 6-inch and 8-inch size. In general, size doesn’t matter unless you have to do grinding lager objects. if you want to buy a grinder for household 6-inch grinders are preferable. Additionally, having compactable grinder advantages you to carry and move your grinder effortlessly. Variable speed means you will have control over the spinning of the wheels. Having enabled variable speed in bench grinder, a user can use his industrial bench grinder even for his household needs. it’s an extra shield of protection for both the machine and user. With this, you can lock the power button of the machine. This option prevents theaccidental running of the grinder which may cause both human and machine damages. To me, the moral of the buying a bench grinder is “First Knowing Then Buying’. At this point you know pretty much about the bench grinder, it’s time to follow the purchasing steps. Decide why you are about to purchase bench grinder? Is it for industrial use, or Woodworking, or DIY and everyday use. I think you already have decided what you will do using your grinder machine. Now, choose your grinder from this detailed top 10 bench grinders review. For your quick selection, we also mentioned bench grinder for sharpening, bench grinder for woodworking, slow speed bench grinder, and bench grinder for DIY and everyday use. After choosing one considering your needs and budget, you can proceed to buy. To purchase, you can visit any local shop or order from a trusted e-commerce store. In the review section, we covered top features and benefits that you will get from those bench grinders. You will also get some additional information including shipping policy, items in the box from the links attached with each product. But still,you may have some curiosity regarding the bench grinders that they are planning to buy. To satisfy your curiosity, we put together a list of 10 frequently asked questions and answered them. Hope you will find it supportive to make your buying decision. Question-1: What Is Better For Mower Blades, 6 Inch Or 8-Inch Grinder? Answer: They both do well on mower blades. More importantly, get one that has the correct abrasive wheels with the necessaries to do the job correctly. Or you can buy different wheels and change them out depending on the job at your hand. Question-2: Can I change the motor rotation? 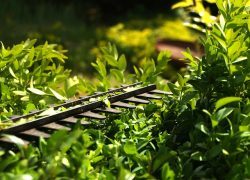 When facing the grinder, I want the motor to run upwards, not downwards. Answer:No, you can’t.Grinders’ motors are designed to running in one direction only. Question-3: Where Do I Purchase Replacement Grinding Wheels? Answer: You can buy them from the manufacturer website, local retailer shop, and from Amazon. Question-4: How Long Does JET 577102 Take To Come Up To Full Speed When Powered On? Answer: It only takes about 2-3 seconds. It has very good bearing and takes a while for it to spin down also had no vibration at speed. Question-5: Will WEN4276 Grinder Work For Making Knives? Answer: Yes, it works, besides industrial bench grinders also able to do this job. Question-6: What is the size of the retaining nut that secures the grinding wheels on DEWALT DW758? 1" is too small, 1-1/16" too big, Is it metric? Answer: It is ametric and it measures 26 mm. But the 26 mm sockets are not even sold at a lot of places. The above assertion about it being 1" is wrong. Question-7: Does Porter-Cable PCB 525BG Work On International Voltage? Answer: No, this is a 120V bench grinder. Question-8: What Is The Country Of Origin Of WEN 4286? It’s made in China and the machine is pretty good. Answer: After unplugging your grinder, you'll need to remove the three bolts that hold the guard in place. Please keep in mind that it is not recommended using this tool without the guard. Question-10: Is It Possible To Remove The Guards And Use This With Buffing/Polishing Wheels Of Porter-Cable PCB525BG? Answer: Yes, the outer and middle guards are removable, the inner guard can be removed after removing the wheel, but be very careful when doing this. A bench grinder gets its perfect status when it’s able to do its job with precision and perfection.All the bench grinder we reviewed in this article have been doing this since their born. Now, as you are reading the last paragraph of this elaborative review and guideline content, if you have come from top to here, I think you know howto choose the right bench grinder for your grinding tasks. Let this home and workshop appliance be your best buddy while sharping, smoothingor cleaning.